R. Mika is a strong Street Fighter V character, maybe one of the best in the game. Despite receiving numerous adjustments by the developers in a recent patch, she continues to make her mark on the competitive landscape thanks to players like Du “NuckleDu” Dang and Keita “Fuudo” Ai. But a recent discovery adds yet another trick to her repertoire, one that has the fighting game community buzzing. While it isn’t quite clear how long this trick has been known, it’s apparently existed since the game released last February, but only recently gained notoriety thanks to a Japanese player known as WORLD_COMBO. In a brief Twitter video posted on April 12, they highlighted Mika’s ability to pass through attacks with her forward dash, which is far from typical. It wasn’t long before Street Fighter V scientist (and possible robot) TOOLASSISTED joined the case, using third-party software to make the game’s hitboxes visible and figure out what was going on. This is where things get a little technical, so apologies in advance. In order to detect scenarios in which characters give or receive damage, video games use hitboxes, or designated areas around character models that make them “exist” in the world. Attacks themselves also have hitboxes, and when an attack’s hitbox intersects with a character’s hitbox (in this case, they’re sometimes referred to as a hurtboxes), it lets the game know that contact has been made and damage has been dealt. For example, in the screenshots provided by community member eiSH below, the faint green lines surrounding Ryu’s body indicate his hurtboxes, while the bright red boxes show his attack’s hitboxes. (The yellow boxes extending from the attacks are proximity blocking markers, meaning they’ll cause a character to guard if they cross the similar-looking boxes around the character, but that’s not relevant to this discussion.). Who knew fighting games could be so technical? Learning is fun! So what did TOOLASSISTED’s research uncover? Well, it just so happens that when Mika performs a forward dash, her hurtbox (again, the area around her body that needs to be contacted by an attack’s hitbox to deal damage) shifts backwards for the first six frames. 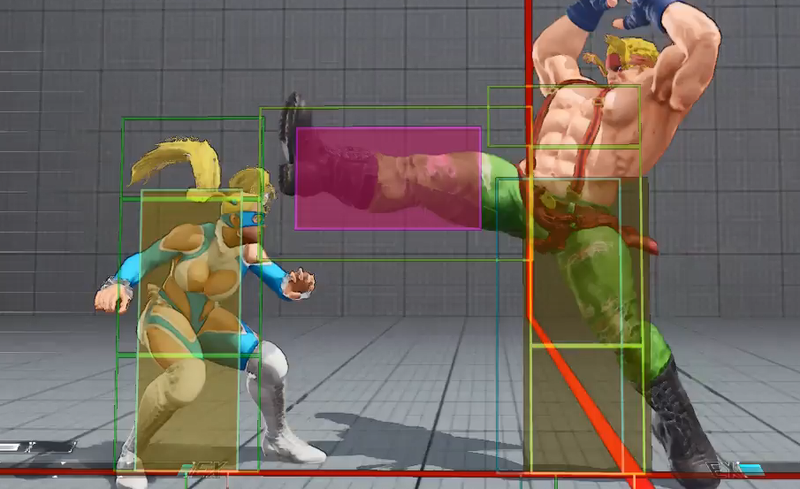 This means that while Mika’s hurtbox is technically working correctly in that it follows the slight backwards movement of the animation, her forward dash essentially includes a quick backdash, which is outside the norm and allows the wrestler to sway outside of an incoming attack’s range before moving in. As this discovery became common knowledge, players began to upload footage of the attacks that can be rendered useless by this oddity. With proper timing, Mika can avoid a number of moves as she gains ground on the opponent, complementing her role as an up-close-and-personal fighter that relies on offensive pressure to employ many of her most potent strategies. Shocking no one, the internet was divided on the issue. Some felt the hurtbox shifting was entirely unacceptable, as characters typically don’t move that way during a simple forward dash, while others held the opinion that it gave Street Fighter V some much-needed personality. As fighting game competitors have dealt with similar problems in the past, it didn’t come as much of a surprise that portions of the community were willing to let the quirk in Mika’s dash rock for the time being. These kinds of anomalies, Graham posits, result in a kind of “organic, player-driven development.” The ability to forgo developer-intended gameplay routes has been a staple of fighting game competition since its inception, and the weirdness of Mika’s forward dash hurtbox gives players something new to mess around with outside the space of scenarios Capcom may have had in mind when creating Street Fighter V.
Javits Arias, a New York competitor, holds an entirely different view. It’s true that players can simply delay their attacks by a split-second to deal with Mika’s dash. But this change has the potential to hurt setups that rely on a category of attacks known as meaties. These moves, which are used on an opponent’s wakeup for additional pressure, already hit on the last few active frames (i.e. when the red hitboxes pictured earlier in the article show up in the game) of an attack. As such, any sort of delay to account for Mika’s dash eliminates the reason a player would use them in the first place. It’s also incredibly potent outside these situations simply as a way to close the gap on characters who excel at keeping Mika out of their personal space. Still, players have contended with stranger things in their favorite fighting games before, and it’s up to serious competitors to find counters. In the end, Mika’s hurtbox quirks are just the latest in a long line of weird fighting game mechanics that competitors have had to deal with. It’s not entirely fair, but it’s not game-breaking either. What it does, however, is force players to think outside the box for new ways to beat the overwhelming wrestler. And what fun would it be if every character in every fighting game worked exactly the same, anyways?